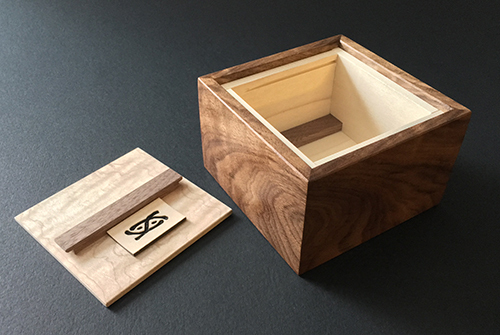 This is a compact version of the Block Box. The tiles slide in a same way to unlock the box but of course you will need to figure out how to start moving these first. 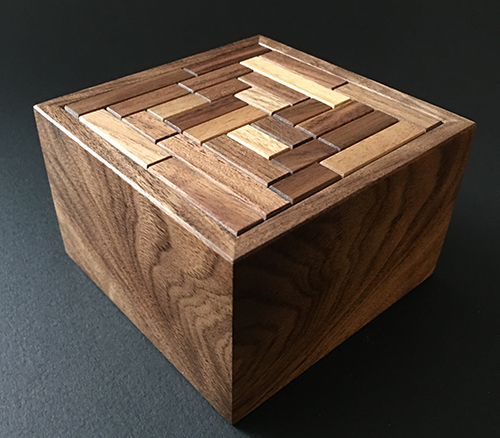 The twists and turns make this a very fun puzzle for everyone. 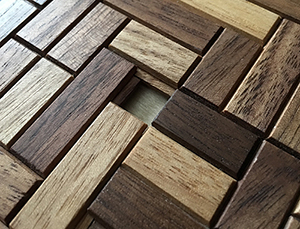 All the different colored tiles are in fact Walnut. The light and dark tones represent different cuts from the walnut log. The arrangement of tiles demonstrates something I started calling a "loop-around" when I first designed the block box. It is a very special case where a sequence of shifting rectangles only forward one square at a time eventually leads to one of the rectangles moving a second time backward. The 'loop-around" became the foundation for building binary switches into the more complex block boxes I made many years ago.